I made really delicious bread over the weekend, and the first slice was a major hottie! But, you guys there was a cave in there! A bread crevice that leads to a carb-version of Narnia, no doubt. That bread will be in your future and mine though again. Keep your little eyes peeled! These cookies aren’t bread. 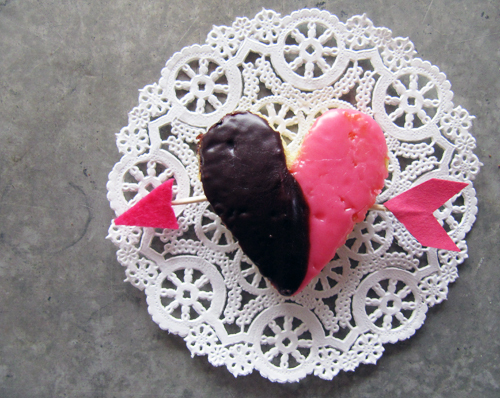 They are, instead, a black and white cookie remixed to be all LOVEly. I’m super into them. I might’ve tried to pipe the cookie dough to be heart shaped. But, it turns out these cookies like to spread out significantly. So those lovely hearts ended up cloud-blob shaped. Nothing a cookie cutter couldn’t fix, right? 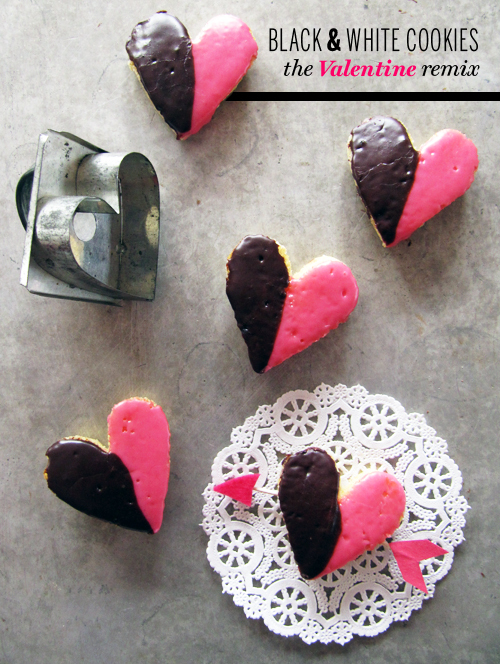 How cute would these cookies be in a clear bag to hand out as a Valentine? You could staple a cute little note up top too. Or just pop them on your new favorite turquoise plate and bring them to work. That’ll work too! P.S. This weekend is the 5th Annual Valentine’s Brunch Party! Follow me on instagram for sneak peaks during the party, and come back next week to see a post recapping the fun! Make cookies: Preheat oven to 350 degrees F.
Whisk together flour, baking soda and salt in a bowl. Stir together buttermilk and vanilla in a cup. Cream butter and sugar in a large bowl with an electric mixer until pale and fluffy, about 3 minutes. Add egg, beating until combined. Mix in flour mixture and buttermilk mixture alternately in batches at low speed (scraping down the side of bowl occasionally), beginning and ending with flour mixture. Mix until smooth. Scoop oval teaspoons of batter about 2 inches apart onto a buttered baking sheet or a baking sheet lined with parchment paper. Bake in the middle of the oven until tops are puffed and pale golden and cookies spring back when touched. About 7 minutes. 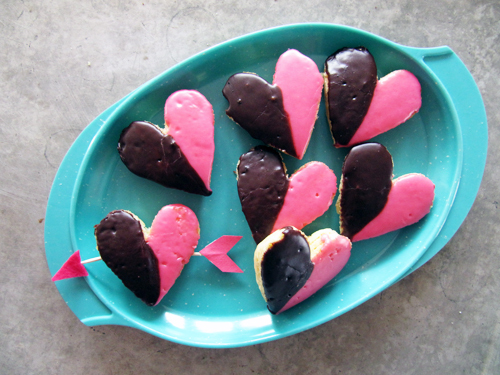 Take out of the oven and cut out the cookies with a heart-shaped cookie cutter. Transfer to a wire rack, flipping so the flat side is on top. Make icings why cookies chill. Stir together confectioners sugar, corn syrup, some orange juice, and vanilla in a small bowl until smooth, add a bit more orange juice as needed. Transfer half the icing to another bowl and stir in cocoa, adding more orange juice, 1/2 teaspoon at a time, to thin to the same consistency of white icing. Feel free to use water instead of orange juice for consistency. Add a drop of pink food coloring to the white and stir until evenly pink! 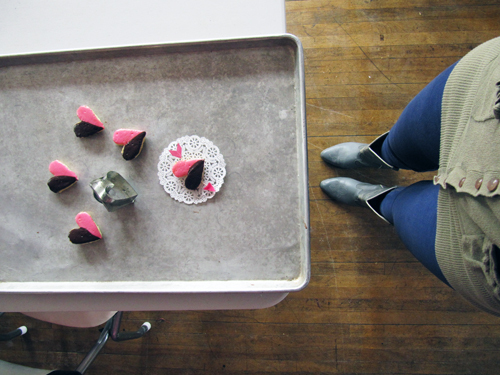 Turn cookies flat side up, then spread pink icing over half of each chocolate over the other half. Enjoy! Sometimes I take pictures on my lunch break. these are so cute! I love the hot pink icing! also, I am SO EXCITED to celebrate Cupid’s Bday at your brunch! I love that you used the baking tray to shoot on – I may have to try that this weekend! Someday I would love to be a helper/dishwasher/goodie eater.. at the NOW FAMOUS Valentines day brunch! I almost wish I could experience that carb narnia, aka carbnia? Nawwwww, look at the hearts. Soo cuuute. I love cupid’s arrow going through! How sweet!